Nvidia 650M in Bootcamp - permanently overclocked ? Discussion in 'MacBook Pro' started by ekovalsky, Jun 20, 2012. I installed Windows 7 x64 via boot camp and upgraded the Nvidia drivers to the 304.48 beta. Speed is obviously great but isn't this a significant overclock ? Also I cannot enable PowerMizer even via registry keys. Whether or battery or AC, the 650M is going full speed. Any idea how to get PowerMizer running ? It would definitely help battery life in Windows if the 650M could quieted... particularly since i have found no way to utlize the integrated Intel video in Windows. 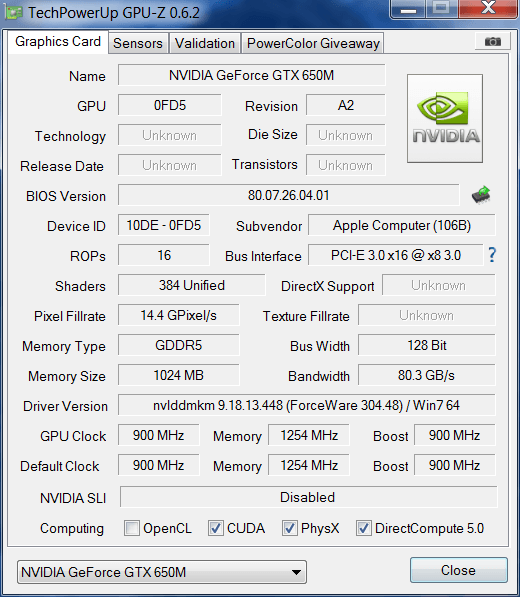 I'm redownloading the Apple bootcamp drivers from 6/15 now and will try the older Nvidia driver that it includes, to see if the 650M can be controlled with those. I'm pretty sure you shouldn't need PowerMizer. I even have mine overclocked further with MSI AfterBurner, but if I'm not running a game or something, it turns the clocks on the card down. It looks like this is just what PowerMizer does? Can you post some benchmark differences with the 650M overclocked? Do they install easily, do you need a modified driver? I downloaded the driver directly from nvidia and just used the modded .inf from laptopvideo2go. It would not install without the modded .inf but no other modifications were made to the driver. I did download Afterburner, the latest version (2.2.2) does allow memory and GPU overclocking on the 650M. I raised it to 1000MHz GPU / 2700MHz memory but didn't have time to run any benchmarks. Honestly I'm more interested in underclocking to extend battery life. Not sure that is possible though as I assume there is no way to modify the vbios on a MacBook Pro. Does that BIOS dump button work? I have the 304.48 drivers, but MSI afterburner doesn't allow me to set a clock speed higher than 530mhz... am I doing something wrong?